The upcoming Geminid meteor shower next week may promise tobe the best sky show of the year, but for many scientists it?s a space lightshow shrouded in mystery. 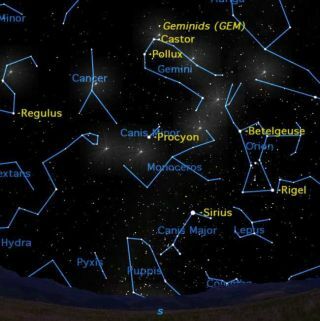 Skywatchers should catch a nice view of the beguilingphenomenon between local midnight and sunrise on Tuesday, Dec. 14. Most meteor showers come from comets, which spew amplemeteoroids for a night of shooting stars. TheGeminids are different. Their source is not a comet but a strange rockyobject named 3200 Phaethon that sheds very little dusty debris ? not nearlyenough to explain the Geminids. "TheGeminids are my favorite, because they defy explanation," said NASAastronomer Bill Cooke, a meteor expert at the agency's Marshall Space FlightCenter in Huntsville, Ala.
Thissky map shows where to look to see the Geminid meteor shower when the peakon Dec. 13 and Dec. 14. Meteor showers are created when the Earth passes through astream of small space rocks, which then burn up as they pass through theatmosphere, creating so-called "shootingstars." ?But astronomers still don't know where all the rocky materialfor the Geminid shower comes from. "Of all the debris streams Earth passes through everyyear, the Geminids' is by far the most massive," Cooke said in astatement. "When we add up the amount of dust in the Geminid stream, itoutweighs other streams by factors of 5 to 500." This makes the Geminids the gorilla of meteorshowers. Yet 3200 Phaethon is more of a weakling. 3200 Phaethon was discovered in 1983 by NASA's IRASsatellite and promptly classified as an asteroid. After all, scientists thought, what else could the spaceobject be? It did not have a tail, its orbit intersected the main asteroid beltand its colors strongly resembled that of other asteroids. In fact, 3200Phaethon resembles main belt asteroid Pallas so much, it might be a small chipoff that massive block, NASA officials said. "If 3200 Phaethon broke apart from asteroid Pallas, assome researchers believe, then Geminid meteoroids might be debris from thebreakup," Cooke said. "But that doesn't agree with other things weknow." Origins of the Geminid meteor shower? Those "other things" includes the orbits of the Geminidmeteoroids, which suggest they were ejected from 3200 Phaethon when theobject was close to the sun?not when it was out in the asteroid belt in acosmic break-up with Pallas. The term meteoroid refers to space rocks that have not yetentered Earth's atmosphere to become a blazing fireball, or meteor. If any ofthese objects reach the ground, they are called meteorites. Some scientists, on the other hand, think that the debrisfeeding the Geminids is created when 3200 Phaethon swings in near the sun andreceives a blast of solar heating that might boil jets of dust into the Geminidstream. To test the hypothesis, researchers turned to NASA's twinSTEREO spacecraft, which are designed to study solar activity. Coronagraphsonboard STEREO can detect sungrazing asteroids and comets, and in June 2009they detected 3200 Phaethon only 15 solar diameters from the sun's surface. What happened next surprised University of California-LosAngeles planetary scientists David Jewitt and Jing Li, who analyzed the data. "3200 Phaethon unexpectedly brightened by a factor oftwo," they wrote. "The most likely explanation is that Phaethonejected dust, perhaps in response to a break-down of surface rocks (throughthermal fracture and decomposition cracking of hydrated minerals) in theintense heat of the sun." Jewett and Li's hypothesis is compelling, but they point outa problem: The amount of dust 3200 Phaethon ejected during its 2009 sun encounteradded a mere 0.01 percent to the mass of the Geminid debris stream ? not nearlyenough to keep the stream replenished over time. Perhaps the rock comet wasmore active in the past? "We just don't know," Cooke said. "Every newthing we learn about the Geminids seems to deepen the mystery." This month when Earth passes through the Geminid debrisstream it will produce as many as 120 meteors per hour over dark-sky sites. Bundle up, go outside and savor the mystery.